The Shadowlands communities coordinated TW efforts paid off yet again. With a clean sweep of wins for all guilds. SL Vanguard now ranked #10 in TW GP defeated . You should come Join us. We have a new guild just started two weeks ago called Nomads sitting at 114gp and growing! That’s another clean TW sweep for all of us. If you love TW you need to stop by! Looking for new people to join us! We're looking for some new players! Get on in here before our next TW! You know you wanna be a wookiee!!!!! Possible spots open in one of the elite alliances in the game! We have a winning program. Low turnover. Tight nit community. Come see us today. If you’re tired of getting smacked around in GA or your guild isn’t doing so hot in TW, this is the alliance for you. We currently host eight guilds that are doing heroic sith and killing their TW opponents. Our Wookiee professors offer the best game advice, we offer roster review in podcast, and our audio chats are entertaining. If this sounds interesting to you come take a swing by and see if you qualify for one of our tribes. Come check out the alliance that is making waves throughout the Galaxy! We’ve got a few spots still open! If you’re looking to enhance your SWGoH game you need to check us out. Hop into our server and let’s talk! 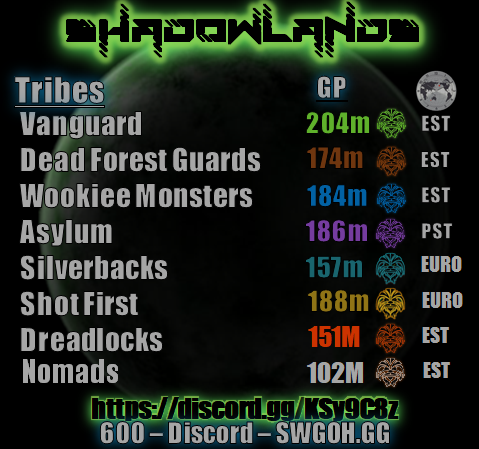 Shadowlands is a small alliance that operates like a single large guild. What started off as a group of friends has developed into a community of players with alliance wide communication. We do not believe in feeder guilds. Outside of our specialized teams to guide you through all aspects of Star Wars Galaxy of Heroes, we utilize voice chat for theory-crafting, weekly meetings, podcasts, roster reviews and trivia events. 1. Galactic Power of 3m+ & 25+ Zetas. 2. Team reqs: Revan, C3PO, Traya, JTR, CLS, Troopers, FO, BH. 3. Hpit 7:15pm, HAAT 8:15pm, HSR 9:15pm All times are EDT. 2. Team reqs: Traya, NS, JTR, Imp Troopers, Resistance. 2. Team reqs: Jedi, First Order, JTR, Imp Troopers, Bounty Hunters, NS. 2. Team reqs: Jedi, First Order, JTR, Imp Troopers, NS, Sith. 2. Team reqs: JTR, CLS, Troopers 7*, FO, NS, BH, Triumvirate/Nightmare. Best alliance in the galaxy! Awesome Leadership and support to help all players, come grab a win for the Next TW! Shadowlands is the best! Join us! Looking for a new home? Your missing out on what we have to offer. Give us a try, we never disappoint. Come join our tw dominant family today!!!!! Great community plus great Leadership equals great place to play and advance your roster. Preparing for another alliance wide TW sweep!